Owls are really cool but they are also really hard to see. 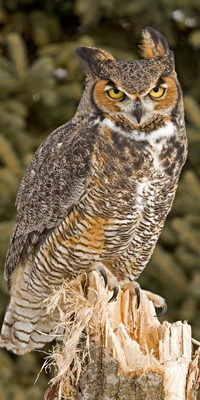 There are two main reasons why that is – most owls are nocturnal (meaning they sleep during the day and are active at night), and because they need to be safe while they are sleeping in the daylight, they blend in well with the trees where they roost, so predators cannot easily find them. While resting, owls are very hard to spot. Some owls roost on the ground, or in the case of a Burrowing owl, in a hole. Not easy to spot here! Most of the owl species that roost in trees do so on lower branches, close to the trunk of the tree, and their feathers are patterned to blend into the bark. They want to stay unnoticed, especially by crows, who seem to have an obsessive dislike of owls. So how do you find an owl to see? 1 – Follow the crows: Crows will mob other birds of prey as well, but owls sit still during the day. So, a mob of crows in one spot is often going to mean the object of their attention is an owl. 2 – Look for good views: As visual hunters who do their business at night, owls need a perch that gives them a good view of their hunting ground. Whenever possible, owls like to sleep the day away in their hunting spot. Watch the ground under trees you suspect of being owl perches, to see if you can spot their pellets or hairballs littering the ground. 3-Process of elimination: While Great horned owls and Barred owls overlap ranges, they will almost never overlap territories. Great horned owls will attack Barred owls, so if you hear a Barred owl you can assume there are no Great horned owls in the immediate vicinity. Additionally, they operate on different schedules. Barred owls are some of the easiest owls to spot during the day, because they are most active around sunset. 4 – The best way to find an owl is at night, and by sound. Get to know the sounds of the owls in your area and start listening around sunset and at different times during the night. If you are in a forested area, you should start to hear owls calling and you can follow the sound to the tree. When you know what to look and listen for, its easy to make the right ID, and every bird in our app has helpful ways to learn to identify birds. Let our Wild About Birds! iPhone/iPad app help you and your family have fun learning about owls.